Times move fast and trends come and go. One trend that seems to be continually gaining in popularity is tattoos, with polls revealing that three out of 10 Americans are tattooed. And most of those have multiple tattoos. We are wondering why so many people are covering themselves up with ink. While there are any number of reasons people choose to get a tattoo, most of them are bad. For example, celebrating your love for another person by getting their name or image tattooed on your body will be regrettable at least half of the time, being that half of all marriages will end in divorce. 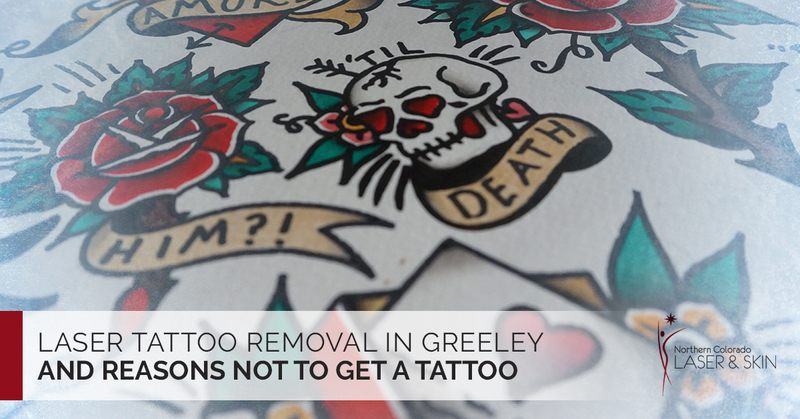 Lucky for you that Northern Colorado Laser and Skin in Greeley offers laser tattoo removal. Here are a few other reasons tattoos are bad. Tattoos are kind of like rings on a tree; they can show how old you are. Nobody wants a marker on their body to see where they have been and when. That Motley Crue tattoo on your arm tells us you partied a little too hard n the early 1980s. That tribal tattoo tells us you lived dangerously in the 1990s. A tattoo is kind of like a yearbook you are ashamed to show others because of the lousy, dated photo of yourself. Tattoos used to be a symbol of individuality. But the fact is everybody has a tattoo, which has made them very non-exclusive. If you want to be unique, be the only one in the room without a tattoo. Tattoos are so popular that they have lost their edginess. Now that stay-at-home dads and middle-aged professionals are lining up to get tattoos, that tattoo you are thinking about getting, whatever it is, just isn’t going to get the reaction you think it is. When it comes to tattoos, you get what you pay for. You can choose between a cheap tattoo and a gorgeous three-dimensional full sleeve. Of course, getting the great tattoo is going to require a second mortgage on your home. All for a piece of art on your skin that you will never regret having. Over the years, tattoos have become more acceptable in workplaces. However, there are still a few major employers who have harsh policies against them. In addition, you might miss out on that promotion just because your boss hates tattoos. That “no regrets” you had inked on your arm, chances are you will regret it down the road. In the last decade, the tattoo removal business has soared nearly 450 percent. That is a number you can’t ignore. Tattoo removal is a billion dollar a year business in the United States, which means a lot of people really hate their tattoos. If you are one of the many people who have a tattoo or tattoos they regret, there is good news. Give Northern Colorado Laser and Skin a call and schedule an appointment for laser tattoo removal.